(Lancaster, Pa., April 8, 2016) - After an off-season of planning, countless phone calls and emails, the Lancaster Barnstormers have a finalized roster for spring training. 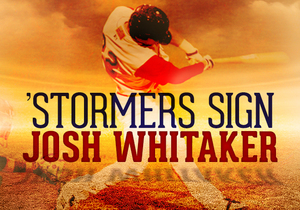 Josh Whitaker, an outfielder recently released by the Oakland Athletics organization, is the final piece of the puzzle. His signing was announced today by manager Butch Hobson. In addition to the players that the Barnstormers have signed, seven others have been invited to camp for a tryout. Of those, five have prior professional baseball experience. Whitaker, 27, spent six seasons with the Oakland organization, peaking at Class AAA Sacramento in 2014. He had his best season in 2011, making the year-end All-Star Team in the Class Midwest League after batting .326 with 34 doubles, 17 doubles and 68 RBI for Burlington (IA). He finished fourth in that league in on-base percentage. During that season, the Georgia native performed a baseball rarity, hitting an “ultimate” grand slam against Quad Cities on July 6. That grand slam came in the bottom of the ninth inning with his team down, 3-0, leading the Bees to the walkoff victory. The product of Kennesaw (GA) State has a career average of .277. He has whacked 77 homers and driven in 324 runs in 514 career games. Last year, he hit .256 with 12 homers and 58 RBI at Class AA Midland. Heading the list of non-roster players for spring training is outfielder Derrick Pyles, who finished last season with the Barnstormers and batted .320 in 14 games. He will be joined by two former Toronto organization pitchers, Kamikani Usui, a right-hander from Honolulu, and Alex Pepe, a southpaw from Florida. Former Sugar Land outfielder/first baseman Edwin Gomez is the only player with Atlantic League experience among the seven. The fourth with professional experience is catcher/infielder Scott David, the 2015 batting champion in the fledgling Pacific Association. Right-handed pitcher Connor Root and infielder Tsuyoshi Fujiwara complete the group. The Barnstormers will have their first workout at Clipper Magazine Stadium on Monday morning, April 11 and will take the field against the York Revolution, Thursday, April 14 at 1:00 in their spring training opener. Lancaster’s regular season will get underway at Southern Maryland on April 21. One week later, the 12th season at Clipper Magazine Stadium opens as the Barnstormers host the defending Atlantic League champion Somerset Patriots. The Lancaster Barnstormers are entering their twelfth season as a member of the Atlantic League of Professional Baseball. Home games are played at Clipper Magazine Stadium in downtown Lancaster, Pennsylvania. Please call 717.509.HITS (4487) or visit LancasterBarnstormers.com for more information.